Ninja Foodi baked potatoes are so easy to make and way better than in the oven. If you’ve never tried air fryer potatoes you’ve got to try them tonight! 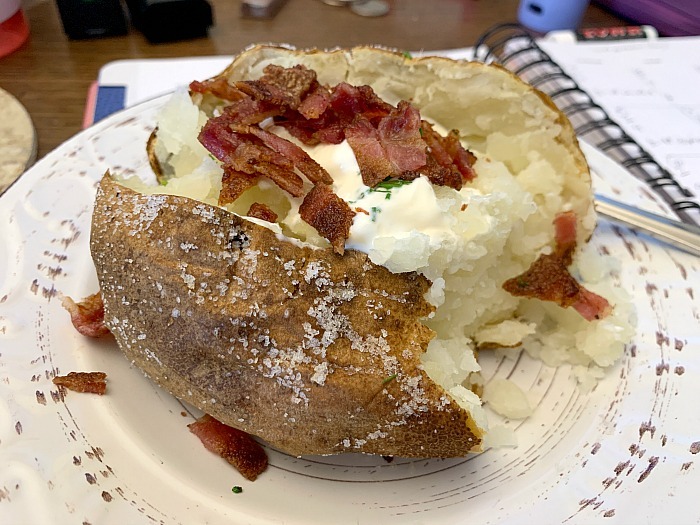 Air fryer baked potatoes…one word, delicious. I thought I had it down which way I liked best which was putting them in my smoker..but these are just as good! Ninja Foodi baked potatoes now take a fraction of the time to make! If you have another brand of air fryer this recipe will work just as well so no worries. The Ninja Foodi is an air fryer meets a pressure cooker and it is making its mark in the cooking world with a vengeance. 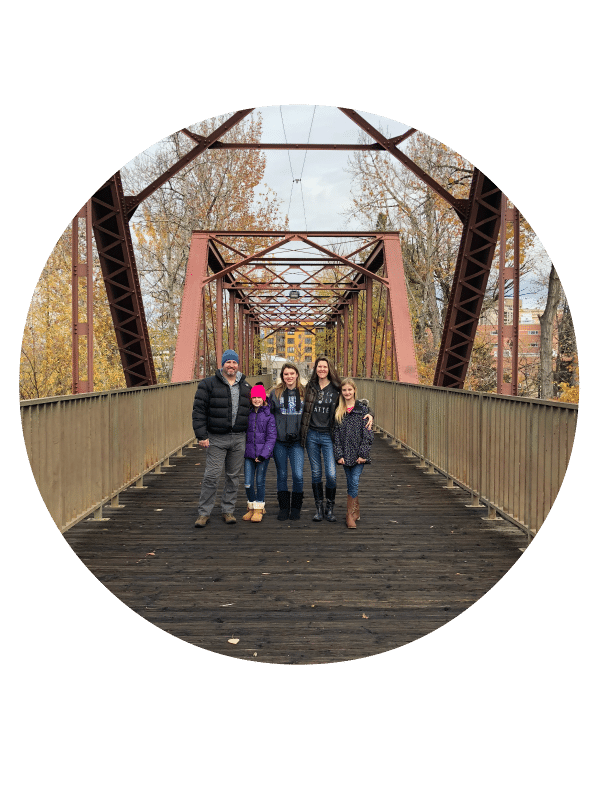 Here’s a free Ninja Foodi cookbook to help you find easy pressure cooker and air fryer recipes too! 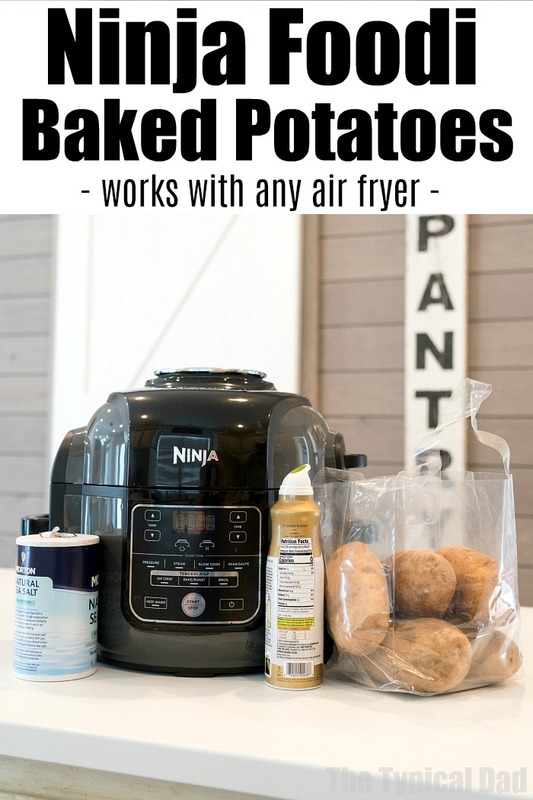 This Ninja Foodi baked potatoes recipe was our 3rd creation using the air fryer function. 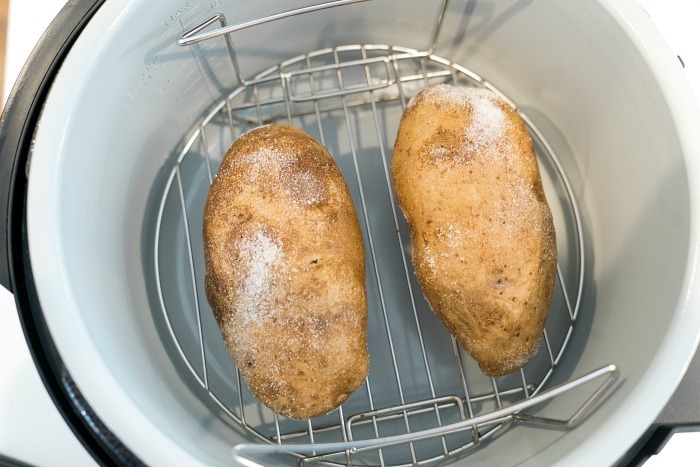 Should you peel the potatoes before putting them in your air fryer? It’s up to you, but in all honesty, having the skin get crunchy for this recipe is the best part. Just make certain that you scrub the outsides of the skins really well so that they are clean and delicious to eat. 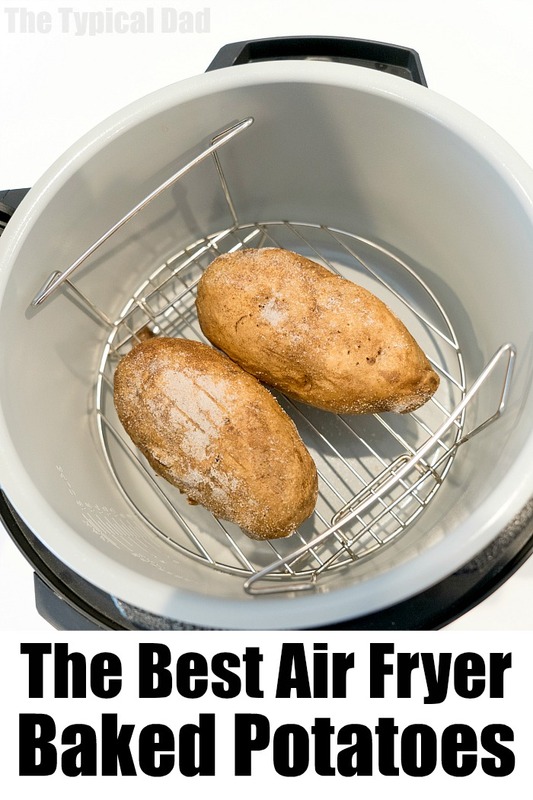 What ingredients do you need to cook potatoes in the air fryer? This is the best part. All you literally need to make these delicious baked potatoes is a potato, a little bit of olive oil and some salt. Literally, that’s it. It’s crazy simple to make this recipe and its one that will turn out perfect each and every time. Do you need to wrap the baked potato in aluminum foil? No. In fact, just don’t. There is no need to wrap up the potato in an air fryer. Doing so will actually make it lose some of its crisp because you’re needing the air in the air fryer to circulate around the entire potato to give it a crispy skin. What toppings would go great with these Air Fryer Baked Potatoes? That’s the best part. ANY type of baked potato toppings will work. Some people even like to top it with ketchup! Whatever toppings you prefer, make it happen. I will say though that this baked potato is delicious straight as it is from the air fryer as well! Baked potatoes can be a great addition to eating food that will leave you feeling fuller longer. With the ease of cooking the potato in the Air Fryer, it’s seriously so simple to have a delicoius meal or snack that’s low in calories in minutes. As with any baked potato, you’ll need to warm it back up the next day. Due to it sitting overnight and the temperature changes, there probably won’t be a lot of crisp (if any) left in your potato. However, the flavor will still be there and it will still taste delicious. Consume your leftover baked potato within 24 hours for the best taste and flavor. And just like that, you’ve got the information at your fingertips to create a truly delicious Ninja Foodi baked potatoes! Give your microwave or oven a break and let your Air Fryer do the trick. You’ll be amazed at how different it will taste being cooked in your Air Fryer than with other methods. That added crisp is one that you’ll love and crave! Ninja Foodi baked potatoes are so easy to make and way better than in the oven. If you've never tried air fryer potatoes you've got to try them tonight! Wash and dry potatoes. Pierce each side of your potatoes with a fork 5 times on each side. Rub olive oil on the outside of each potato, then generously coat with salt so it sticks to the outside. Place the Ninja Foodi trivet upside down (necessary for larger potatoes so lid will close) and into the pot, place potatoes on trivet. Turn machine on. Close air fryer lid (one that is attached). Push air crisp button. Set temp. to 390 degrees for 45 minutes. Timing depends on size of potatoes so check after 35 minutes, pierce with fork and if not yet tender into the middle then close lid again and let it continue to cook another 5-10 minutes until middle is tender. Enjoy stuffed with chili, cheese, or butter. Outsides will be crispy and tasty with the salt covering it and insides will be fluffy as ever.